To be attached to the underside of a bird cage to catch debris. 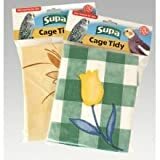 Supa Seed Wild Bird Feeder 10 Port 30"
This entry was posted in Birds and tagged Cage, Pack, Supa, Tidies by One Boutique. Bookmark the permalink.